This new (and brief) Unity programming post explains how to create a pair of GUI.Toggles that modifies the value of a single boolean. This means that, when one toggle is selected, the other one should be automatically set to unselected. This is best explained with an example, which can downloaded at the end of the post. 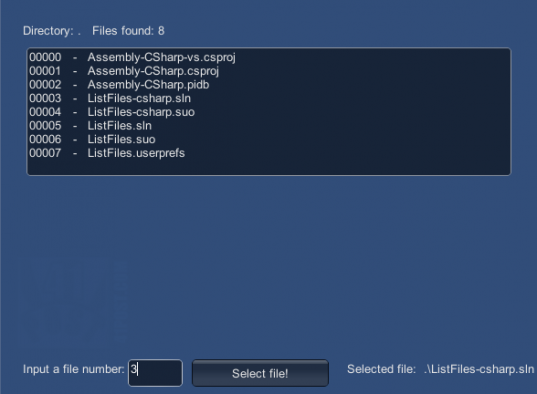 This Unity3D programming post explains how to create a C# script that lists the files in a directory. Additionally, for the sake of completeness, this post also shows a rudimentary method that allows to select one of the files from the list and how to deal with some of the potential IO errors.